Not only are traditional sedans like the Mazda6 becoming an endangered car species, but so are manual transmissions in general. It’s rare to find the coveted combo of a stick shift in an affordable and fun to drive family mid-size sedan, but the Mazda6 had you covered. Until now. Cars Direct has learned from the 2019 ordering guide that Mazda will only offer the 6 sedan with the six-speed automatic for all trim levels. Up until now, you could only get the manual on the base level Sport trim, powered by a naturally aspirated 2.5-liter SkyActiv four-cylinder with 187 hp. The optional 227-hp turbocharged SkyActiv four was paired only with the automatic, and that remains unchanged. For just under $23,000, buyers used to be able to row their own gears while having enough room for the family and Costco runs all at once. Sadly that’s finished now. 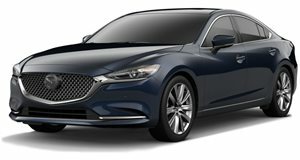 Mazda has also made some packaging changes to the sedan, too, which includes a slightly higher base price. The Sport trim is now $1,875 more than it was previously, starting at $24,720. That’s really not a big deal because it’s still directly in line with pricing for base trims of the 2019 Honda Accord ($24,640) and Toyota Camry ($24,875). Mazda also likely decided to increase the price in order to establish a greater price difference between the all-new Mazda3, which starts at $21,920. But that the price increase and discontinuation of the manual comes with other benefits, including more standard features that were previously optional. Examples include the i-Activeness system with Smart Brake Support, lane-departure warning, lane-keeping assist, automatic headlights, and adaptive cruise control with stop & go. Other new standard items are automatic headlights and rain-sensing wipers. The elimination of the Mazda6’s manual also means there’s now just two vehicles in the automaker’s lineup that has one: the MX-5 Miata and the new Mazda3 hatchback. However, the latter can only be equipped with the manual if you upgrade to the $28,395 Premium trim. The MX-5 begins at $26,650. We can’t say we’re entirely surprised by Mazda’s decision here, but chances are the take rate for manual-equipped 6 sedans was sadly too low. Not all mid-size sedans have to be soul-sucking.